Cheri Beasley will be North Carolina’s next Supreme Court Chief Justice. She is the first Black woman to take the helm of the state’s highest court. Gov. Roy Cooper made the announcement Tuesday afternoon. Beasley, who has served on the high court since 2012, will succeed current Chief Justice Mark Martin. He announced at the end of last month that he would resign Feb. 28 to become dean of Regent University School of Law in Virginia Beach, Va.
“It is absolutely not lost on me that this week this nation will celebrate Valentine’s Day, and I think it must be fitting, because I am certainly feeling love,” Beasley said at a news conference. She said she was excited to continue working with her colleagues and to work with other people in the judicial system, like court clerks and law enforcement. She wants to make sure the justice system is sound and that it are serving the people of North Carolina in the way that it should. “I know that we will find successes along the way, especially through our commitment and our pursuit of justice for all people,” she said. Beasley was initially appointed to the Supreme Court by former Gov. 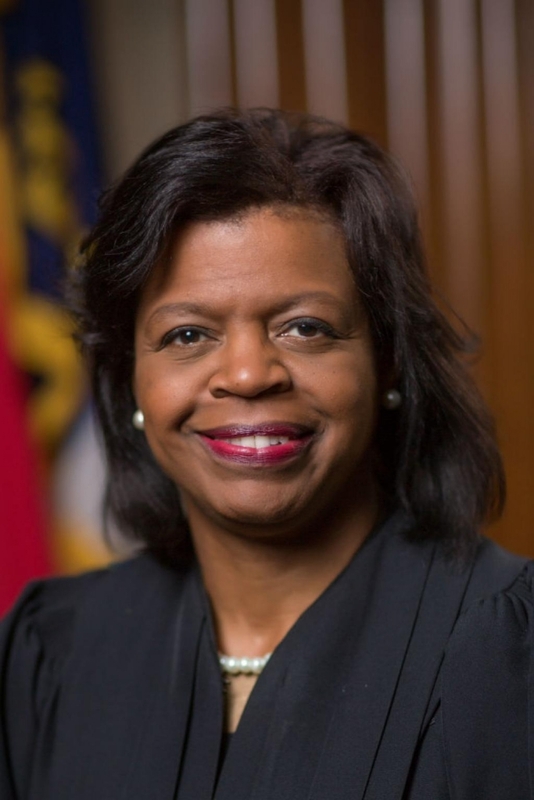 Bev Perdue to replace retiring Justice Patricia Timmons-Goodson. She ran for re-election in 2014 and won a full term, which was to expire in 2022. She said she absolutely plans to run for election again next year to keep the Chief Justice post. She previously served on the state Court of Appeals – where she was the first Black woman to win election to a statewide office in North Carolina – and as a district court judge for the 12th judicial district in Cumberland County. Her appointment to the Chief Justice position leaves another vacancy on the bench for Cooper to appoint. He has not yet announced whom he will choose, but it could shift the court’s balance to a 6-1 Democratic majority. Republicans had hoped to keep a balance on the court and urged Cooper to appoint another Republican to replace Martin or bestow the Chief Justice title to senior associate justice Paul Newby, who is also a Republican. State Republican Party Executive Director Dallas Woodhouse criticized Cooper on Twitter before he even made the announcement that Beasley would be Chief Justice for not choosing Newby. The party as a whole released a statement after that Cooper’s choice to not choose Newby and Justice Robin Hudson, who has also served more time than Beasley, was purely political. Newby also released a statement on Twitter indicating his disappointment with Cooper. When asked if he felt any obligation to choose a Republican to fill Beasley’s vacancy, Cooper said he would choose the best person for the job. He said he expects to make that announcement next week. Former Republican Gov. Pat McCrory appointed Martin, who had the longest tenure on the high court with more than 20 years on the bench. Republicans have been trying to retain power over the courts for the past two years. In 2016, there was talk of GOP legislators considering making a rare court-packing move to keep partisan control after the election of Democratic Justice Mike Morgan over Republican incumbent Justice Bob Edmunds. When that fizzled, Republican lawmakers hatched a plan to redistrict state courts in an effort to get more GOP judges on the bench. They had also proposed legislation to transfer judicial appointment power from Cooper to the General Assembly and considered plans to change judicial selection altogether. In the most recent Supreme Court race, there was more talk of court-packing if Republican incumbent Barbara Jackson was re-elected to change the majority of the high court from Democratic to Republican control. Democratic Justice Anita Earls was ultimately elected to the bench. Martin’s announcement that he would be resigning was unexpected. A couple Republicans have already announced they would run for a seat on the high court in 2020: Phil Berger Jr., who currently serves on the state Court of Appeals (he is also the son of Senate President Pro Tem Phil Berger), and former Senate member Tamara Barringer, who is an attorney. Newby has confirmed he will run for Chief Justice in 2020. A little more than a week after Martin announced his resignation, his second in command and appointee, Administrative Office of the Courts Executive Director Marion Warren announced he too would be leaving and following the Chief Justice to Regent. Warren will be the senior associate dean of the university under Martin. Feb. 28 is both of their last days with the North Carolina judiciary. Martin appointed McKinley Wooten as interim director of the AOC in Warren’s absence, but Beasley has the power to appoint the permanent director once she takes over as Chief Justice. McKinley has served as a deputy director with the AOC for over a decade. This is a breaking news story and will be updated as more information becomes available. A fuller version of this story will be made available Wednesday morning on ncpolicywatch.com.